Video Converter - File format is an app that can convert video files from and to these extensions: MP3, AVI, MPG, GIF, FLV, WMV, MP4. pic the extension, choose an output format and convert any video, create image albums and video folders, compose image files and work with music with no format problems. 1. Tap the button to select your file. 2. You can select your photo from camera, gallery, iPhone and iPad. 3. Once you have selected your video you can convert this media to many formats. 4. Choose the file name and that is it! You will have your video in the desire format. Share your work, holidays photos or any kind of image you've converted with any other messaging, mail or social network application. Links your work with PDF Converter, Music Converter and photo Converter and finally complements the application with the best tools. Video Converter: Edit multimedia is able to work with the following extensions: MP3, AVI, MPG, GIF, FLV, WMV, MP4.. It converts video, movies, films and more instantaneously, Video converter is quite easy to use, you can convert your video files to formats such as WMV, FLV, MPG, AVI and much more. It converts your documents and files to other formats with the help of our various file and format converters: PDF Converter, Music Converter y Image Converter. Convert your video to MP3, your movies and images to any format so that it is always compatible with Video Converter. Enhances the export of your favorite images and videos. You can have your video in the format you want. 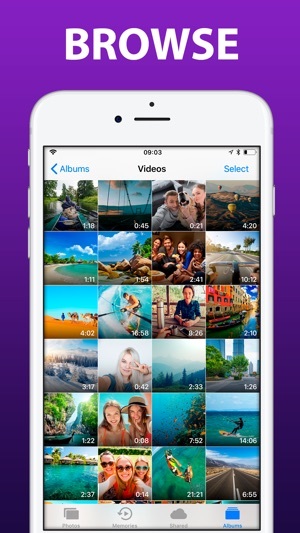 Video Converter: media Editor convert your Video files to various formats, right on your iPhone or iPad. Conversions are so quick and quality is more than great. Conversions are done on a secure cloud server, which makes conversion faster and much more battery-friendly. You have to an internet connection to use this app. Convert video to MP3 and others, recordings and images to other formats, create video files from other image files and video recordings of audio is a reality with Video Converter, transforming images and making new videos in other formats is easy and Quick. Convert video file to MP4 player or standard video player, convert MP4 to GIF, convert AVI to FLV, MPG to WNV, AVI to GIF, MPG to FLV, AVI to MNV MP3 to MP4 and more combinations are possible Thanks To Video Converter, file converter and video converter. Finish your office and video works with conversions like GIF to MP4, MP4 to AVI, WNV to FLV, FLV to MP4, AVI to WNV, WNV to MP4, MPG to GIF, MP4 to MPG, MP4 to GIF, AVI to MP4 . - Length of Subscription: 1 month ( 7 day free trial) or 1 year. - Price: $2.99 per month billed monthly. $24.99 per year billed yearly. I downloaded the app, tried to use it (which the only way to do that is to purchase a subscription for it) it did not work for me. I thought okay that's fine I'll just cancel the "FREE" Trial (the same day I downloaded it) only to get charged at the end of the trial anyways!! This company is trash, their app doesn't work, and I wish I could get my money back! Horrible, crashes, hard to navigate and you can’t even use any features the advertise without giving them your credit card info and starting a free trial. Freezes when drag and drop 1.6MB .mov input file.